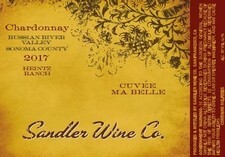 The 4th vintage of Sandler Heintz Ranch Cuvée Ma Belle Chardonnay comes from the dramatic 2017 growing season. We picked Heintz on September 21, three weeks after the 110 degree heat wave and two weeks before the Tubbs Fire, that devastated a large part of Santa Rosa. Heintz lies 14 miles west of the reaches of that fire, so the vineyard and surrounding area were safe, but everyone in Sonoma County was affected greatly. Our hearts go out to Sonoma County residents, we hope you never experience anything close to that again. As with all four of the Heintz Chard we have made, we didn't exactly "press" the grapes in the press, but we let them tumble there on themselves for the better part of an hour. The weight of the grapes falling on themselves pushes the juice out, and we collect it in the press pan below. This is a technique which approximates the "old school" method of treating Chardonnay less gently with the hopes of a more age-worthy wine. We anticipate the drinking window of this apple-scented, and nicely-tart Chardonnay between late 2019 and 2025.